Demoing PAIA FATMAN, basic tones of both VCO's and Filter/Resonance for a skeptical friend to prove how classic and awesome this sounds. Still available from PAIA, it's got MIDI input and a whole host of classic analog controls - alone or stack it with your favorite analog synth and you will get a huge sound. Also recorded of Peter Gunn theme as multitrack audio from online midi file, to show it can be used to playback midi tracks vs. live keyboard. 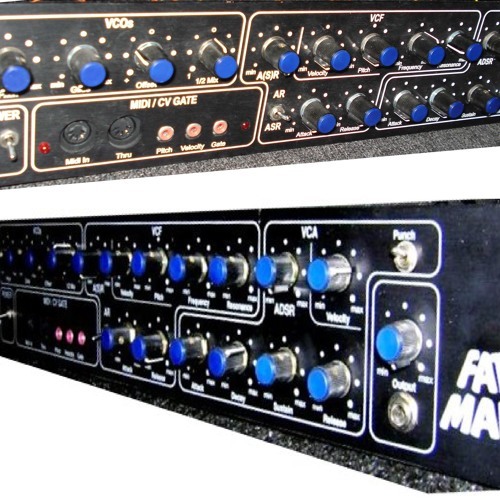 Added 3 more tracks of Dual VCO PAIA FATMAN recorded in unison with another single VCO analog synth Added the Fatman being driven by Midi output of a Groovebox, to demo that it can track Midi very well and allow you to carry on with the tweaking of the analog controls (some recording distortions) No effects on these, so a bit or reverb and echo/chorus etc. will be be even better.